I had a question come to me this morning, and I’m not sure about the answer. Is DNA universal? If life evolves on a completely different planet, would it have DNA molecules just like ours, or would it evolve a completely different protein structure for its “code of life” than what evolved here? This is a closeup of a DNA molecule. 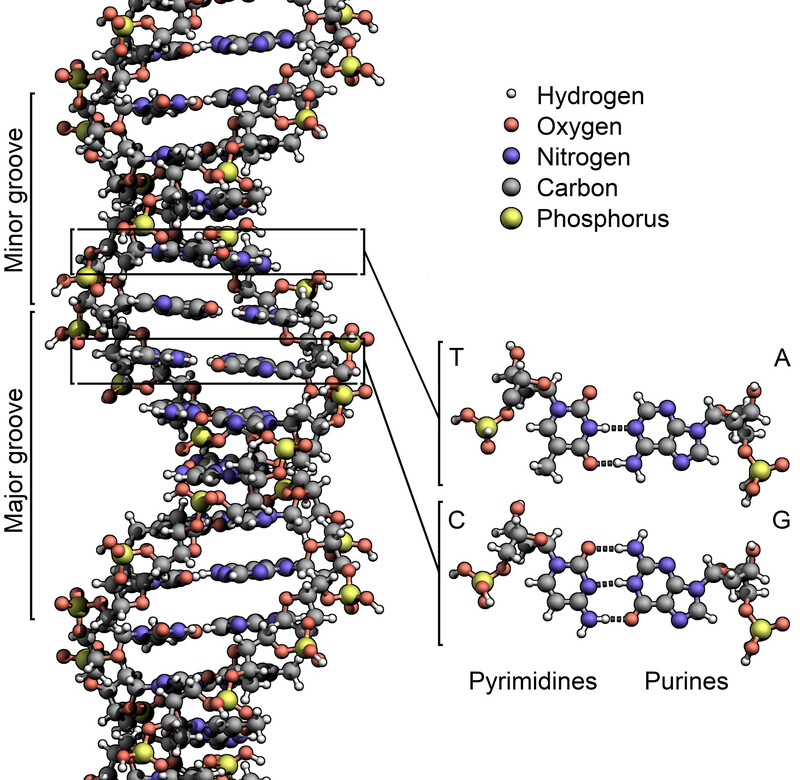 This picture (swiped from Wikipedia) is included here because it illustrates a point — DNA does not have an elegantly simple structure. It is a complex protein, but one thing I do not know is whether that complexity is actually justified, or if it is a result of the random processes which created the first building blocks of life. Perhaps a simpler protein would have more transcription errors, and this design is more resistant to those problems. I believe that if life were to evolve elsewhere, it would need to have a way to store genetic information like DNA does, but it would probably have a very different protein structure for storing that information. I’m guessing that it would have a similar level of complexity to DNA, though. The Stargate SG-1 episode “Hathor” has a premise that’s incompatible with my thoughts. A related question: Would we be able to eat plants and animals that evolved on another planet, or would their chemical structures be just different enough from ours that our digestive systems would not be able to find any useful molecules? Even if an extraterrestrial life form would have carbohydrates that have the same overall structure, chirality could prevent your enzymes from splitting them into digestible parts.